Hot damn is all I can say. 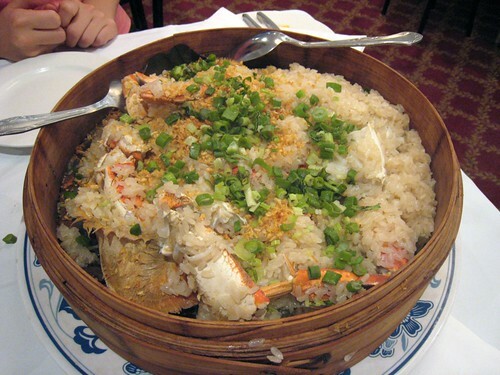 Before knowing I'd be chowing down on crab over noodles at Congee Village, I had made plans with XJS to meet up at Imperial Palace for their crab over rice. 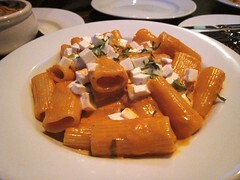 She had talked about how good it was when we had eaten at Canton Gourmet, and we had finally picked a date to go. 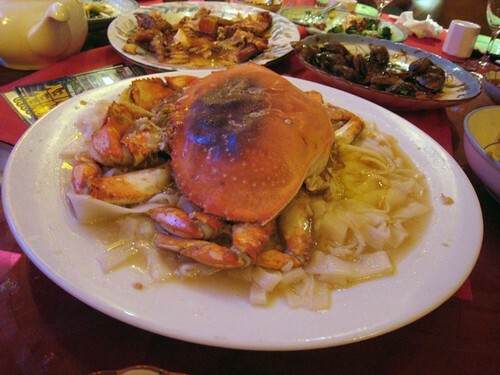 Instead of Dungeness crab, Imperial Palace uses regular blue crabs cut up in quarters and halves. 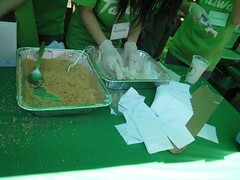 * Once I tasted the rice I found myself barely even bothering with the fussy creatures. 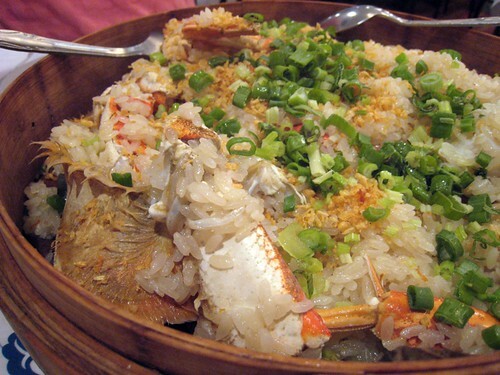 In addition to a bed resting on the bottom, the rice had also been packed into the cavities of the crab shells, in perfect position for soaking up their sweet, briny juices. And when I caught a spoonful coated with rich tomalley, the chewy grains filled my mouth with a whole other level of seafood-infused awesomeness. We had also ordered pan-fried noodles with chicken and sauteed pea shoots, but the rice, for me, was the only star of the show. If I can swing it before I leave, I will totally be back. *EDIT: XJS thinks it was a Dungeness crab, and now that I'm looking at the photos again I think it was too. Oops! 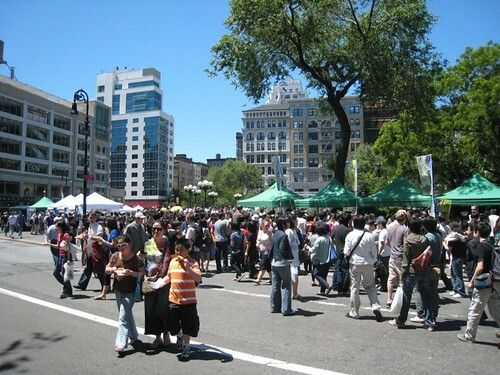 Last month while my dad was in Taiwan (you can see how terribly behind I am these days) my brother and I took my mom to the annual Passport to Taiwan event in Union Square for a taste of the motherland ourselves. Bafflingly, this year the food stalls were arranged at the edge of the park where only a narrow sidewalk separates the park from the street, meaning that the stands' long lines spilled out into the middle of the road. The road wasn't closed, though, and there were no cones or barriers set up; the whole time we were there, the area was a continuous, honk-filled battle of man vs. car. When my mom spotted the above stand, she stopped in her tracks. "These are good!" she exclaimed. So what the mommy wants, the mommy gets: I muscled my way into the crowds and bought two for the three of us to share. So what is it, exactly? 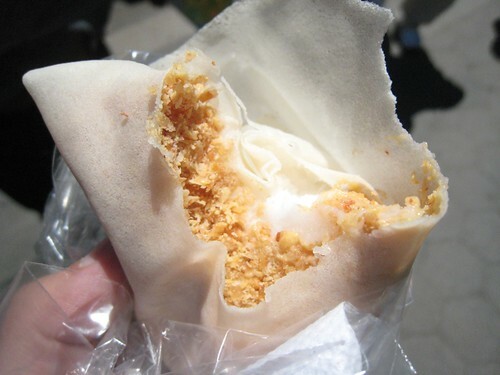 A thin, soft crepe, filled with the shavings from an enormous block of Taiwanese peanut brittle and a scoop of coconut sorbet. 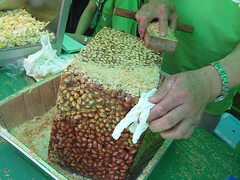 It was fun to watch them assembling the treat, and even more fun to eat it. The hand-held packet was a nice combination of crunchy, cold, nutty, creamy, and chewy, and though it got too sweet for me in the end, I'm glad I tried it. My parents live in a neighborhood where there is a fairly decent Indian population. My dad isn't a fan of their heavily spiced fare, though, meaning other than when my brother and I bring some into the house, opportunities for my mom to try Indian food are rare. So after our brittle-filled crepes, we made our way over to Curry Hill where we dipped in and out of several restaurants before settling on Chennai Garden, sister to Tiffin Wallah, for lunch. 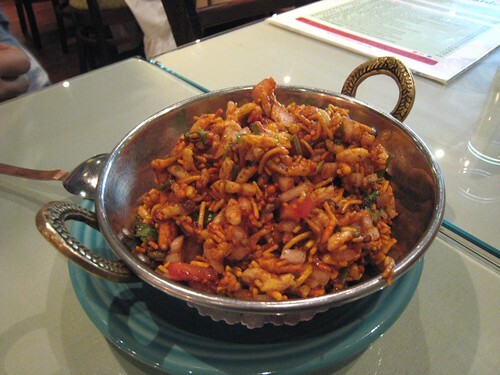 Above is an order of the behl puri , "a sweet and tangy mix of puffed rice, crispy noodles, onion, and cilantro," a flavor-packed opener that whet all of our appetites. 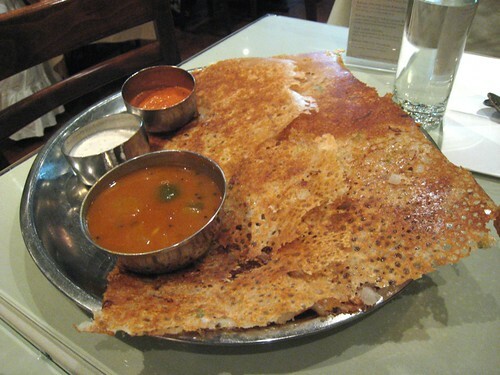 Paneer rava masala dosai , a huge cream-of-wheat crepe filled with cheese and spiced potato. I haven't had dosai many times before, but I thought this one was really good, especially when paired with the coconut chutney. The crispy edges of the dosai were my favorite part. 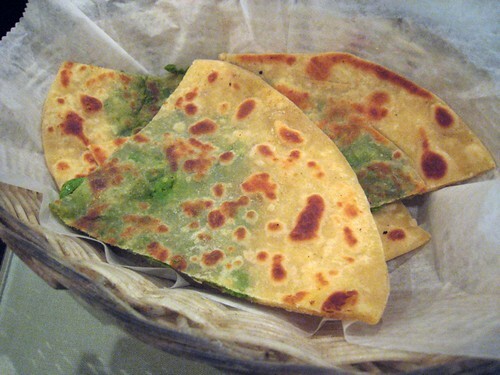 Pea paratha, a flaky bread stuffed with a mash of green peas. Bhindi masala, an okra curry with tomato and onions, and another dish I can't remember the name of. 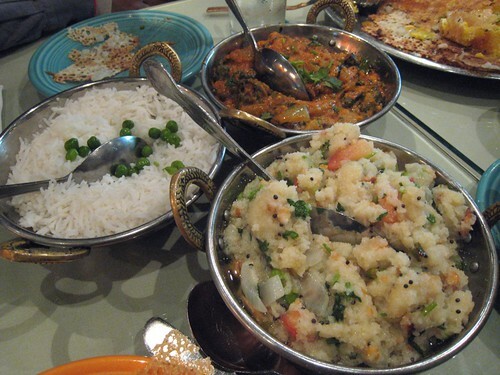 Since Chennai Garden is a kosher vegetarian place, none of the items we ordered had any meat. But it wasn't a light meal, either; the cream of wheat prepared with ghee, mustard seeds, cashews, chiles, chopped tomatoes, and onion was probably one of the heaviest things I've ever tasted. One bite flooded my mouth with clarified butter, and my second bite confirmed that the first was all I had needed. 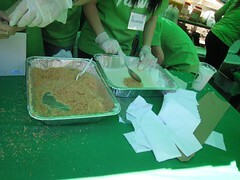 The flavor was good, but none of us had more than a few spoonfuls. When I went to visit my mom a day or two later, I ate a piece from some pancakes that were sitting on the table, and realized that she had thinned out the leftover cream of wheat with wheat flour, eggs, and water and then griddled up the batter into a pile of savory pancakes. They were terrific...just one more reason to celebrate the ingenuity of me mum. 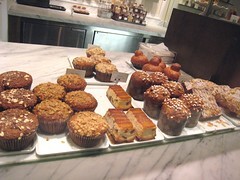 With time to kill before meeting up with DL, I stopped in at Bouchon Bakery for a cup of coffee and got sidetracked by their display of pastries. No one is surprised, I assume. 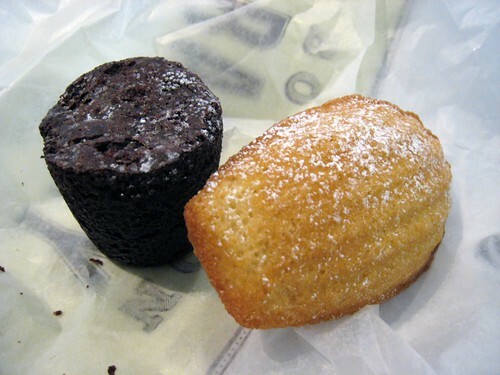 I ended up with a chocolate bouchon and a madeleine, both of which were heavier creatures than they first appeared to be. The bouchon was a inky little cork studded with dark chocolate chips, something between a brownie and a flourless chocolate cake; despite its density it melted on my tongue, surprising me with its intense, fudgy sweetness. 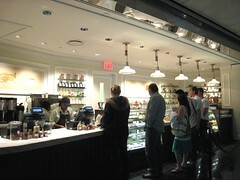 As for the madeleine, it was better than the one I had in New Orleans, but I wasn't all that wowed. Next time, a macaron. I'd only ever had crab steamed over noodles one other time, and it had been a bit of a disappointment. Ever since, I had wondered if perhaps the flavor of this particular dish was just always that delicate (read: bland); if so, I couldn't understand what people were raving about. 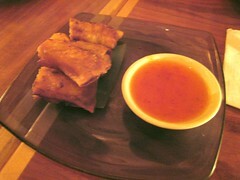 And then, last month, I tasted the dish again at Congee Village. Now, I'm not much of a fan of Congee Village. Aside from their kitschy, over-bambooed decor, I've always found their food too sweet, too oily, poorly executed, and full of off-flavors. I only go from time to time because I have karaoke-loving friends who like the restaurant's private rooms. Sure enough, when I found myself there for LT's birthday after Sylvia's and the miracle fruit party, my sampling of what was on the table when I arrived confirmed my previous impressions. But the crab, oh the crab. Once the fat crustacean came out and I tasted the rice noodles resting underneath, I realized there was another universe beyond bland crab. It was difficult not to keep putting another few forkfuls of the briny, seafood-infused ribbons on my plate; each bite tasted rich with crab and garlic and was completely addictive. 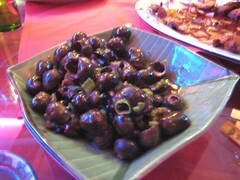 Later, there were also snails in black bean sauce, another surprisingly addictive item. 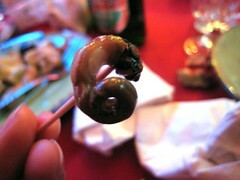 Some of us stuck to delicately teasing the gastropods out of their shells with the aid of a toothpick, but for the most part, the men were too manly to bother and slurped out the curlicues of meat using their mouths instead. I can't say which method was better, but all of us ended up with sauce-smeared lips and happy tongues. After we left Congee Village we hit up some other bars, but at the end of the night we wound up at The Blue Seats, a slick-looking sports bar in the LES, where for the ten of us there was somehow more eating. Rigatoni in vodka sauce, mac 'n' cheese with truffle oil and lardons, and "baked potato" french fries, all of which were surprisingly decent. And the food was buffered by shots of tequila and a friendly female server...which I believe made it a very happy birthday for LT, indeed. 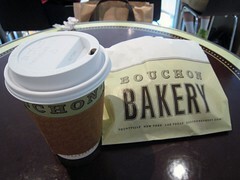 On one of my first half-day Fridays (how I love my company's summer hours) I made plans with BH and JSK to have lunch. I'd heard Sylvia's is one of those Harlem tourist spots that rides more on reputation than deliciousness, but when BH suggested the place I figured I ought to find out for myself. 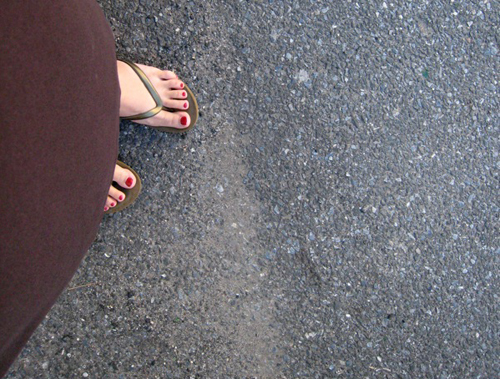 It was a gorgeous, sunny day, and since I had time to kill I walked around for a while before finally meeting up with the two of them at the restaurant. 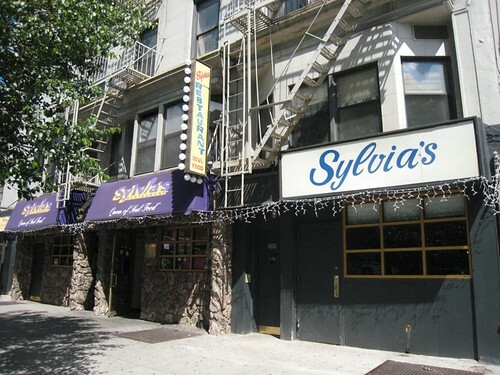 Inside Sylvia's, the restaurant's long history felt palpable, in a good way. Little aura of franchising here, except for the bottles of Sylvia's hot sauce sitting on the tables. 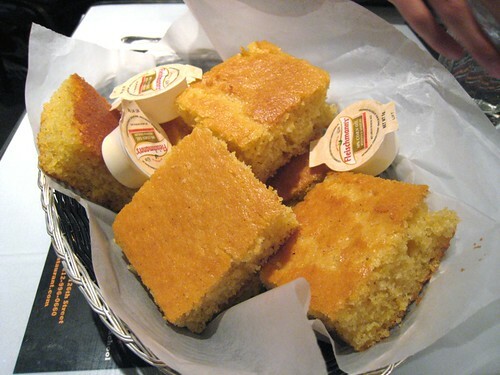 Almost immediately after we sat down, a basket of golden cornbread was delivered to the table, pleasantly nubbly and just sweet enough. Could have been moister, but as I was famished by that point, I scarfed down a square before reminding myself that there was a lot more coming. ...creating the proper delivery of "chicken and waffle," at least in my mind. 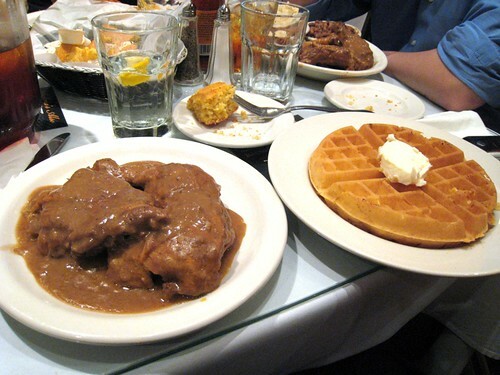 Though later I understood why they come separately; the waffle soaked up the gravy and soon became a sodden mess, prompting me to fork the mushy remains to the side and finish my chicken with the cornbread instead. 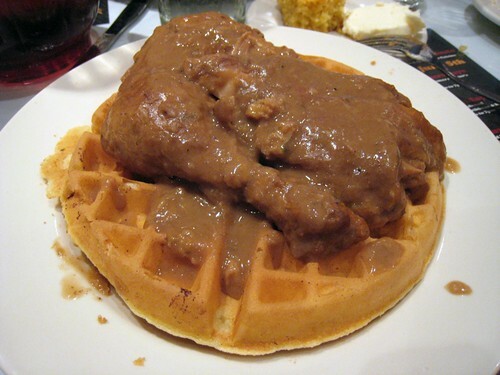 As for taste, the chicken was fine, the waffle average. The gravy was a bit too salty. 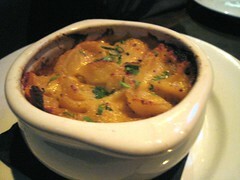 I took some forkfuls of BH's mac 'n' cheese and JSK's potato salad (which looked exactly like mashed potatoes, so I did a double-take when I realized I was eating potatoes with mayo instead of buttery mash), and on the whole, the food was okay but nothing spectacular. I parted ways with the boys not quite feeling mentally satisfied by my meal, but at least later I went on to the miracle fruit party, a taste-trip thorough enough to cover all of the day's eats. Last week I picked up my first (and possibly only) portion of the CSA vegetable share I had signed up for back in January. Nothing terrible happened—I just simply won't be in New York City anymore and there's too much for me to do these days (packing, moving, etc) for me to cook bushels of greenery every few weeks until I go. At least my brother will take over for me, so maybe he'll cook some veggies for me. Hint, hint. 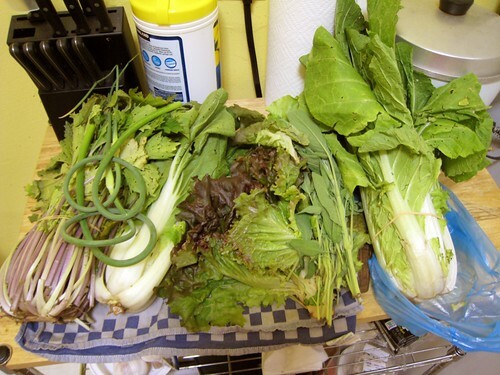 Since I'm splitting one CSA share with three other people—we set it up so that two people split each week's veg on alternating weeks—here's the half portion I took home: bok choi, half head; Chinese cabbage, half head; red sail lettuce, half head; buttercrunch lettuce, half head; red vein mizuna, one bunch; garlic scapes, two; sage with flowers, one bunch. There was rhubarb and green mizuna as part of our bundle too, but RL took those, and ended up swapping her mizuna for an extra bundle of rhubarb in order to make a proper pot of jam. 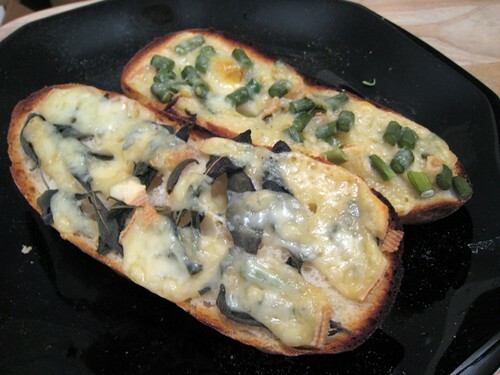 I gave half of my head of red mizuna to my folks, and with the other half did kind of a pantry clean-out dish with half a box of thin spaghetti and a cup or two of grated aged gouda that had both been languishing for a while. 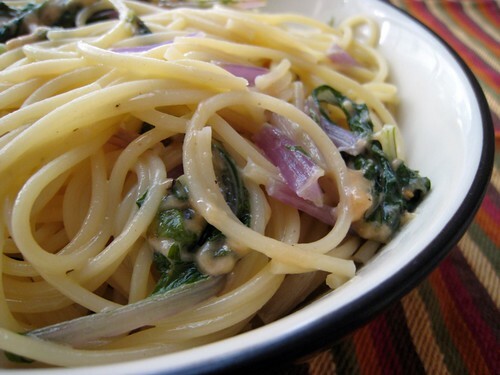 Basically I sauteed mizuna in a bit of butter (stems first, then leaves) and tossed the mizuna, gouda, and a few ladles of pasta water in with the drained, cooked spaghetti with the heat on low. After a few minutes the cheese melted into a rich coating over the pasta and mizuna, resulting in something between mac 'n' cheese and fettuccine Alfredo. I was pleased by the pretty color of the mizuna against the spaghetti, but upon eating it I discovered the pasta was heavy with oil. 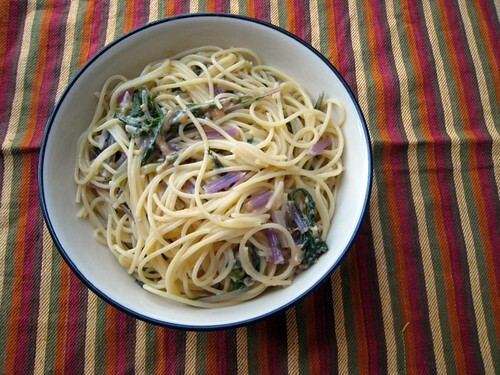 For lunch the next day I tossed in a cut-up grilled chicken breast and some chopped sage, both of which were good pairings, but the pasta still slicked my lips. Next time, less cheese and no butter. 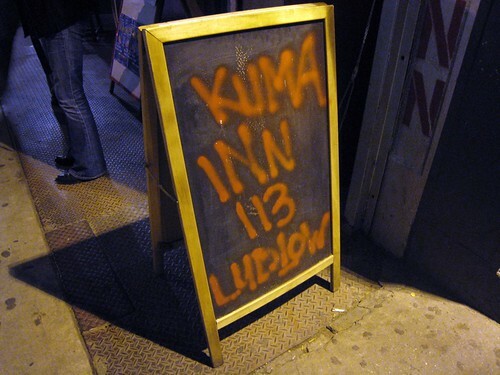 To meet with BH, WK, and CY one night, I found myself wandering around the Lower East Side hunting down Kuma Inn, a place whose name I'd heard floating around for a while now. Tucked between the entrance to a large bar and an abandoned-looking building, the narrow steps to the cozy upstairs restaurant would barely be noticeable if not for the placard sitting on the sidewalk in front. Good thing. 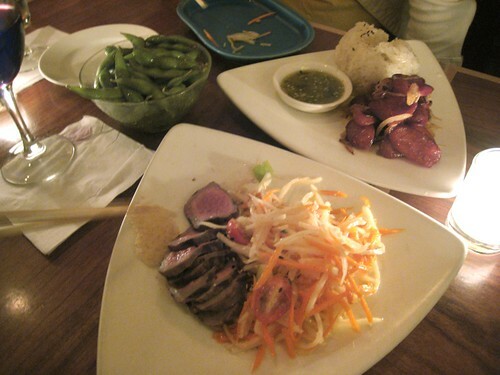 We started off with steamed edamame in Thai basil-lime oil; sautéed Chinese sausage with chili-lime sauce and Thai sticky rice; and a special, which was grilled beef tenderloin paired with a carrot/daikon slaw. Though I didn't taste much basil or lime in the edamame, these three were all tasty, especially the sausage and sticky rice, which was set off exceptionally well by the bright and pungent chili-lime sauce. Then there was a small plate of lumpiang shanghai, the Filipino-flavored version of Chinese spring rolls; pancit bihon, thin, stir-fried rice noodles with bits of pork, Chinese sausage, bean sprouts, and carrots; and "sake braised beef," which tasted like regular soy-braised beef, paired with "Asian root vegetables"—daikon and carrots. 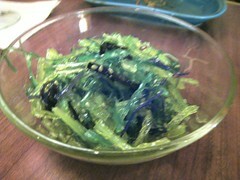 The "mixed seaweed chuka salad with sesame and chili," was good but utterly typical, the same salad served in your average generic sushi joint. CY even pointed out that you could buy this stuff frozen in the supermarket. Another special, which the server had described as being "Chinese roast pork buns but filled with pulled pork, and with peanut sauce on top" wasn't quite what we had expected. 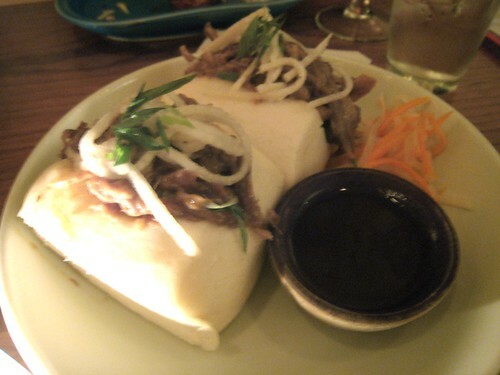 On the plate were two mantou, each split and filled with shredded pork that had been mixed with peanut sauce. 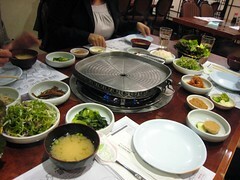 There was hoisin sauce on the side for dipping, but the meat was plenty sweet without it. Finally, we got "sautéed tofu, Thai basil, and wood ears in spicy soy mirin," and a grilled fish (I don't remember what kind), which was another special. I thought the flavor of the fish was just slightly stronger than it should have been, although CY and WK disagreed. 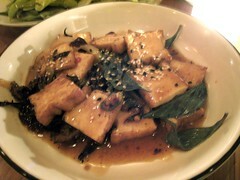 The tofu dish, despite its long, fancy listing of ingredients, tasted like nothing more than tofu braised in brown sauce, albeit with the herbal punch of basil. 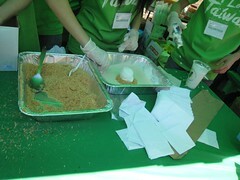 I'm not sure what the hold-up was on our desserts (were the frozen sweets being churned to order?) 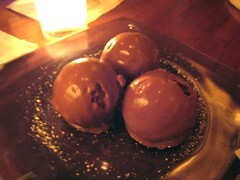 but at least our dish of rich, spicy chili-chocolate ice cream ended up being comped because of the lag. 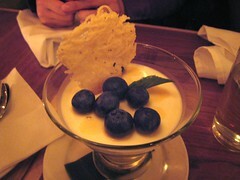 The lemongrass coconut panna cotta tasted exactly like Thai green curry in room-temp custard form. I suppose if it had been advertised as such it wouldn't have been so jarring, but with the blueberries on top, it was just more strange than anything else. 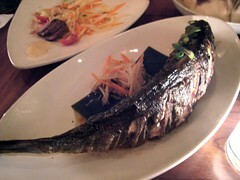 For the most part, I found the food at Kuma Inn good but not particularly outstanding. Most of the dishes felt very homestyle, which I know is sort of the point, but I think for someone who does a decent amount a home cooking, small portions of dishes that aren't much awesomer than what I can whip up on my own don't draw me. One of my favorite go-to restaurants is Soba-ya. I usually end up there when I'm looking for a nice-looking, low-key place to bring out-of-town guests and/or a casual-but-not-too-casual place for catching up, but also when I'm just craving good quality, comfortable Japanese food. The service is discreet and unobtrusive; the food interesting, tasty, and well-prepared; and the bill never goes much, or at all, above my budget. It's not so small you feel cramped, nor so large it feels impersonal, and even sitting next to other people, the atmosphere somehow always feels private. 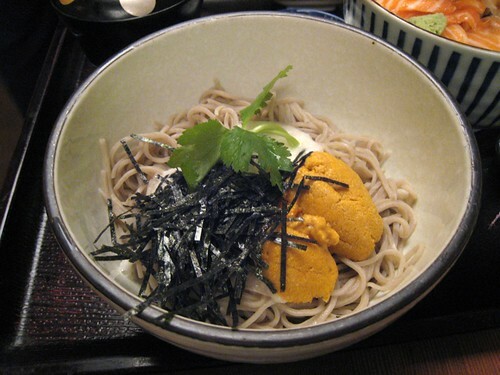 When I went there with DT last month, we decided to split an order of cold soba topped with uni and grated Japanese yam. 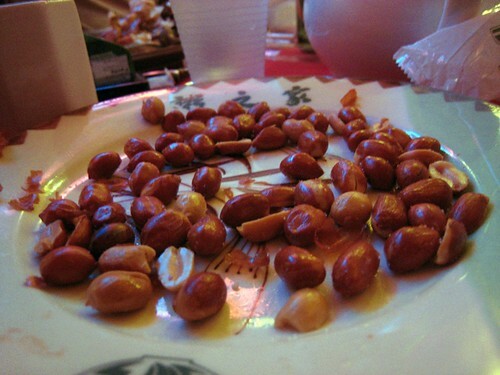 The uni was delish—creamy and sweet—but I found the rest of it rather disappointing and just a bit flavorless. 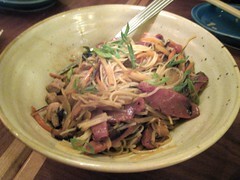 Ironically, though the restaurant specializes in soba I never like their soba dishes as much as their other stuff. 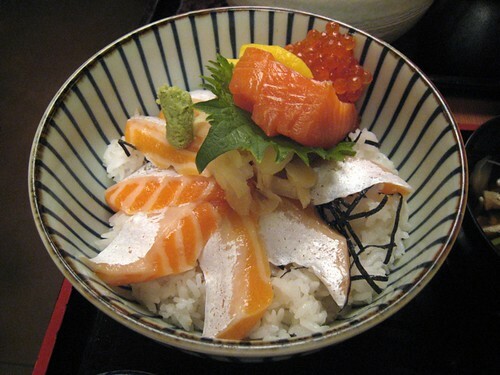 But I do love the other stuff, specifically their sake-oyako don: a bowl of rice topped with salmon sashimi and salmon roe. The bowls come in "small" and "regular" sizes; even though I always mean to order the small, I've accidentally ordered the above "regular" more than once, thinking "regular" meant the smaller size. Or maybe my stomach took over my brain for a moment? 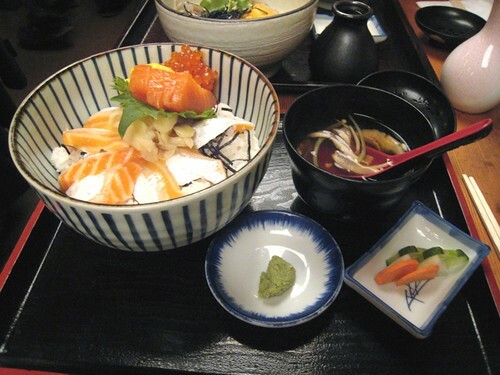 The regular size includes a hot, savory broth of enoki mushrooms, a small dish of pickles on the side, and of course, a much larger portion of salmon, roe, and rice. The sashimi is meltingly tender and I love the salty little pops of roe. Though the other size comes without the soup and pickles and is smaller, it is definitely a more manageable and appropriate amount, especially when you are also splitting a soba dish like DT and I did. As for dessert, the first time I ever had honey-wasabi-flavored ice cream was here, and I've ordered it ever since—its elements of floral, sweet, milky, and cold combined with a pronounced kick of wasabi were eye-opening. But to my disappointment, this time the honey-wasabi had no heat. 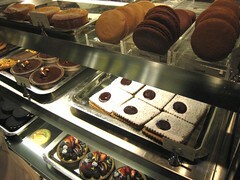 The other two flavors we chose, yuzu and black sesame, were good as usual though. 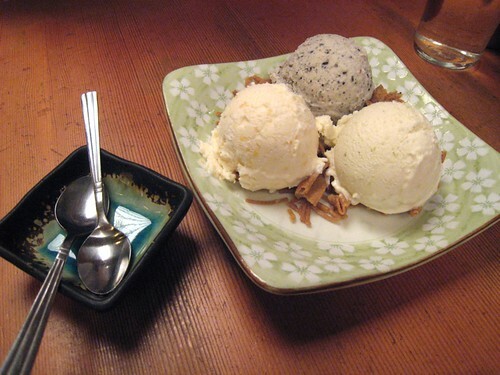 The three scoops rest on a bed of fried soba bits, no doubt made in the restaurant from leftover noodle scraps, which are a perfect crunchy topping for the ice cream. Unless something changes, I'll probably keep going to Soba-ya for as long as I have access to it. I'm sure there are better places to get a tray of cold soba and maybe even a better sake-oyako don, but I haven't found a place I like more yet. Suggestions are welcome, though! While camping out at Think Coffee one night (a place I've written about before) to finish up a freelance project, I got this cheese plate to quiet my stomach rumblings. 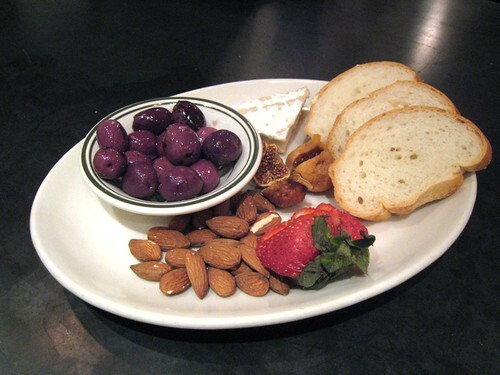 The proportion of olives/nuts/etc. 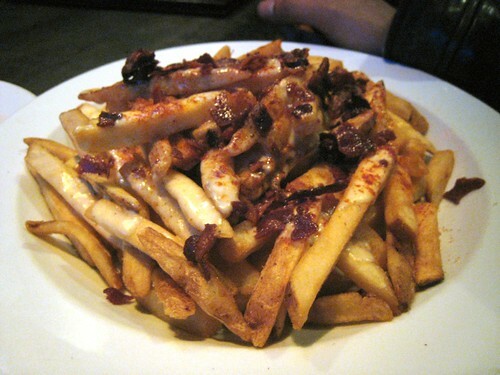 to the amount of cheese seemed too high; I prefer a more cheese-centric plate, I guess. As for the cheese, I asked for the Hudson Valley Camembert, which was so creamy and soft it spread like whipped butter, but was just a bit too stinky for me. Nope, the contents of that bowl aren't about to be tossed in a pan for a stir-fry. 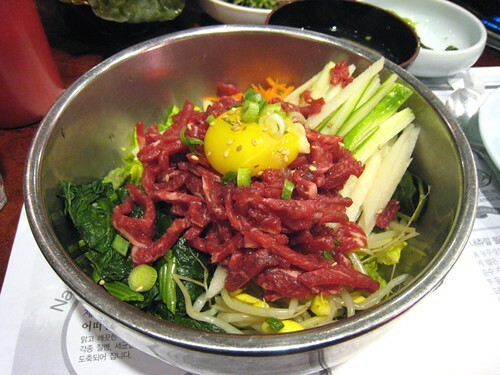 Above is an order of yukhwe bibimbap , raw marinated beef with a raw egg yolk and assorted veg, meant to be consumed as-is. Consider it a rice-heavy Korean sibling to the French steak tartare. We were at the Northern Boulevard San Soo Kap San a few weeks ago, after MH's graduation from law school. I had been aiming for the hwe deopbap, which I had first tried at the restaurant's Flushing branch and which I had eaten at Sura, but I went for the yukhwe bibimbap when I couldn't find the Korean sashimi bowl on the menu. The raw beef bowl turned out to be a decent choice. To eat it I threw in a bowl of hot rice, spooned gochujang over it, and mixed it all up into a sort of rice/raw beef salad. 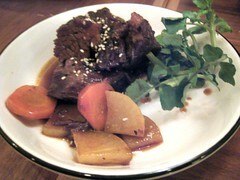 The raw beef is a little chewy and slightly sweet from its marinade, and the slivers of firm, juicy korean pear mingled with the rice, meat, and veg were a nice surprise. I think this place is also known for its sam geup sal , barbecued pieces of unmarinated pork belly served with the usual accompaniments. 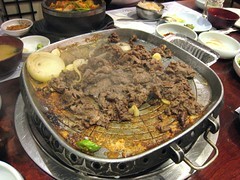 But the four of us opted to put bulgogi on the grill instead, which we scarfed up in packets of lettuce, rice, and fermented soybean paste. 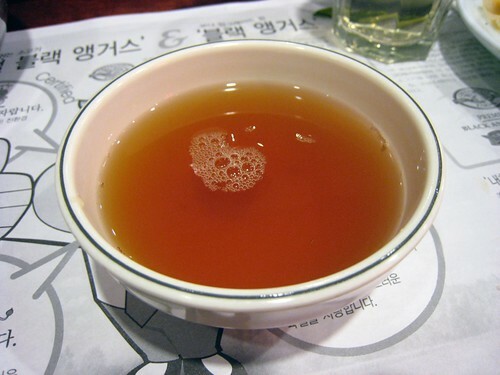 Afterwards small bowls of a cold, sweet broth were brought out, tasting of cinnamon and dates; a perfectly refreshing end to the meal. For three years of accomplishment: congratulations MH!